3.7 x 2.2 x 0.9 in. The Canon PowerShot A3300 fits the needs of the casual snapshooter to a tee, with a good wide-angle to fairly long telephoto reach and smart features that make getting quality photos easy. It's worth a closer look. The Canon PowerShot A3300 is based around a 16-megapixel, CCD image sensor coupled to a 5x optically-stabilized zoom lens that offers focal lengths ranging from a useful 28mm wide-angle to a moderate 140mm telephoto. Maximum aperture varies from f/2.8 to f/5.9 across the zoom range. Images on the Canon A3300 IS must be framed and reviewed on its 3-inch LCD panel, as there's no true optical viewfinder on this camera. The A3300 display has a resolution of 230,000 dots (~76,800 pixels, with three dots per pixel). 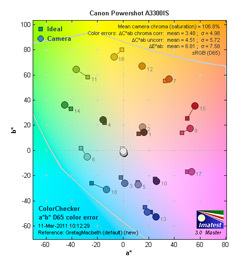 The Canon A3300's sensor allows sensitivities ranging from ISO 80 to ISO 1,600 equivalents, which extends to ISO 6,400 in Low Light mode. Exposures are determined using Evaluative, Center-weighted Average or Spot metering, and direct control of shutter speed or aperture isn't possible on this camera (except for a "Long Shutter" mode which lets you choose shutter speeds between 1 and 15 seconds). 2.0EV of exposure compensation is available, in 1/3EV increments. 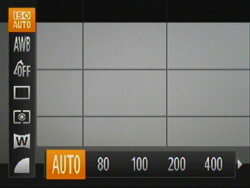 Seven white balance modes are available on the Canon A3300 IS - Auto, Manual, or five presets. The PowerShot A3300 IS's built-in flash strobe has a range of 13 feet at wide-angle, dropping to 6.6 feet at telephoto, and recharges in ten seconds or less. The PowerShot A3300 offers Canon's Smart Auto mode, which intelligently selects optimal settings automatically for you, based on 32 predefined shooting situations. Ten manually selected scene modes are also available, and the camera includes Creative Filters such as Fish-eye Effect, Miniature Effect, Toy Camera Effect, Monochrome, Super Vivid and Poster Effect. A new Discreet mode disables the camera's sound, flash and AF assist beam for shooting in quiet situations. As well as still images, the PowerShot A3300 IS can capture video clips at 720p HD resolution (1,280x720 pixels) at 30 frames-per-second, a first for the Canon A-series. VGA (640x480) and QVGA (320x240) resolutions are also available. Miniature Effect is available during moves, which drops the frame rate to as low as 1.5 fps. The Canon PowerShot A3300 IS stores images on SD / SDHC / SDXC / MMC / MMC Plus / HC MMC Plus cards, and draws power from a proprietary NB-8L rechargeable lithium-ion battery pack. Battery life is rated at 230 shots on a charge, to CIPA testing standards. Connectivity options include USB 2.0 high-speed data and NTSC / PAL standard definition video. The Canon PowerShot A3300 IS began shipping from late February 2011, priced at around US$180. Available colors are grey, red, blue, silver, and pink. It's been nearly a year since we mourned the demise of the Canon A Series digicam. You know, the PASM modes with the AA batteries in a chunky plastic box you were nearly embarrassed to pull out at a party. Except it took great pictures. And taught you the craft. So we're over it. Really. But when we pulled the Canon A3300 IS out of the box and turned it on, we wondered if we had really recovered. It's so small it should be sold as a keychain, but its controls are not for the arthritic and never mind modes helpful for learning photography. Then we looked at the Canon A3300's images. It was as if we'd just bought new specs. We hadn't realized what we'd been missing. Vivid, crisp shots. Nothing at all like the texture-less things we saw from the Panasonic ZS10. An epiphany dropped into our lap. Canon is onto something, we thought. They've attacked the cellphone dictatorship with the passive resistance of a tiny camera with big quality. History has spoken. Put your cellphone down. Pick up an A-Series camera and have some quality fun. It's easy. Well, except for one thing. Look and Feel. No kidding, it should come with a key ring. The Canon A3300 fits in your pocket or purse, smaller than a wallet. But it doesn't give up the big screen. And for those of you comparing it to last year's model, the Canon A3300 has the advantage of a Zoom ring around the Shutter button, rather than a Zoom toggle on the back panel. The controls are way too stiff for my taste. And they don't seem to break in. The good news is that the Mode dial's stiffness keeps it from easily changing while the Canon A3300 rides in a pocket. But if you hand this to a friend or relative to take your picture, I guarantee you they will press the Mode dial to trip the shutter three times before you tell them the Shutter button is further to the left. There is no grip to speak of on the Canon A3300 (apart from three small thumb bumps on the back), but let me ask you if you've ever bothered about a grip on your cellphone? Didn't think so. I have to say the Canon A3300 is an attractively sculpted camera. And you can get it in red, black, blue, silver, or pink. Controls. The Canon A3300's two-tone design helps organize the controls into a hierarchy of their own. But they don't break down into black and silver (or color) controls. They break down, instead, into controls that draw your attention because they contrast with their setting and those that don't. So within the Canon A3300's black trim on top, you have the nearly invisible Zoom ring (you feel that and don't have to look for it), the invisible Power button (which you don't need to see either), and the black Mode dial, which is large enough to notice but doesn't distract you. The contrasting control within the black trim is the Shutter button, the one thing you do want to keep an eye on. Same scheme on the back panel where the four-way navigator arrows are black and everything else is, like the panel, silver. This is a very smart arrangement that highlights the controls you are most likely to need while keeping handy ones you expect to look for. So what are the controls? Let's take the tour. On top from left to right, there is a very tiny one-hole microphone just under the second three in the model name, a three-hole speaker, the slightly-recessed Power button, the Shutter button surrounded by the Zoom lever, and the Mode dial. On the Canon A3300's back panel to the right of the 230K-pixel, 3.0-inch LCD is the four-way navigator surrounded the Function/Set button with arrows doing double duty: Up handles Rotate/EV, Right cycles through the Flash modes, Down is Delete/Self-Timer, and Left is Focus modes (Macro, Normal, Infinity). Above the navigator are the Face Select button to cycle through the recognized faces, selecting one to focus on, and the Playback button, which functions as a Power on/off control as well (without extending the lens). Below the navigator are the Display button to cycle through the simple display options and the Menu button. 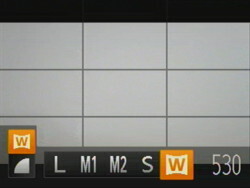 Display is also used in Smart Shutter Scene mode to select between Smile, Wink, and Face self-timer triggers. Between the navigator and the Display button there is a small green status LED. On the right panel above the unusual but functional eyelet for the wrist strap, there's a flap covering the AV/USB port. Canon provides only a standard video out cable with the A3300. Lens. The 5x optical zoom in the Canon A3300 ranges from 28 to 140mm in 35mm equivalents, including a good wide-angle that can capture a room and an adequate telephoto for distant landmarks. It's extended by a 4x digital zoom for a total 20x zoom range. And that range is optically stabilized as well. That's a bump up from the 4x A3100 lens, and although it's a bit shorter than that camera's 140mm telephoto equivalent, wide-angle is more generous than the A3100's 35mm. Focusing Range extends from 1.2 inches to infinity at wide-angle to 3.0 feet to infinity at telephoto. 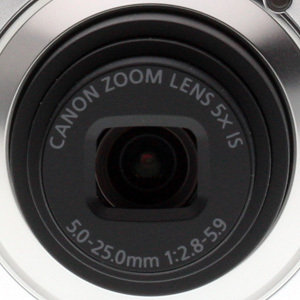 In Macro mode, according to Canon, wide-angle gets as close as 1.2 inches and telephoto 1.6 feet. In Smart Auto, Macro mode is one of the recognized scenes. Maximum aperture at wide-angle is f/2.8 and f/5.9 at telephoto. Shutter speeds range from 15 to 1/1,600 seconds, depending on the mode (Long Shutter taps into 15 seconds, otherwise it's 1.0 second). ISO ranges from 80 to 1,600 with a Low Light Scene mode ranging from 400 to 6,400. Our lens quality tests show the Canon A3300's lens to be slightly soft in the corners at both wide-angle and telephoto, with very mild barrel distortion at wide-angle, which becomes barely perceptible at telephoto. 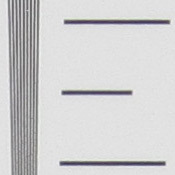 Some moderate chromatic aberration is visible at both wide-angle and telephoto. Modes. For a simple camera, the Canon A3300 provides quite a few modes. They are all variations on automatic shooting, though, so experimenting with them won't cost you the shot. Program mode provides the most control over the Canon A3300. 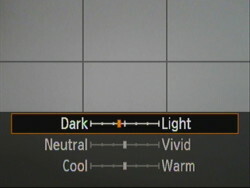 You can't adjust the shutter speed or aperture, but you have some control over white balance, ISO, and other options. Live mode uses sliders to adjust Brightness, Color and Tone as you view the image on the LCD. Just press the Function/Set button to see the sliders and use the arrow buttons to select a slider and change its value. The LCD will instantly show you the effect. Smart Auto analyzes the scene before setting up the camera for the shot. This is where you'll find Scenes that aren't in Scene modes (like Sunset). 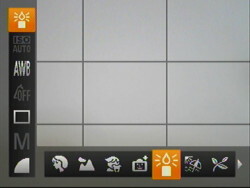 An icon appears in the corner of the screen to indicate the situation the camera has recognized. It does it quickly and is a boon if you are switching between normal and macro focus modes frequently, as it'll detect object distance and make the change for you. But you don't have the control over exposure you do in Program mode. Fortunately, you can still select between 4:3 and 16:9 aspect ratios. 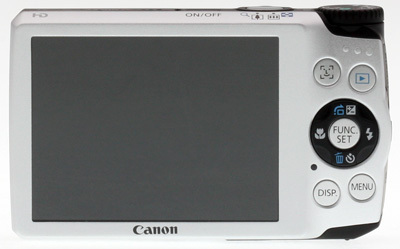 In Easy mode, which functions both in Record and Playback modes, the Canon A3300 displays instructions on the screen. In Record, for example, you just press the Shutter button (although you can turn the flash on or off, too). In Playback, pressing the Function/Set button starts a slide show. Scene mode automatically optimizes camera settings for special situations. Scene modes include Portrait, Landscape, Kids & Pets, Smart Shutter, Low Light, Beach, Foliage, Snow, Fireworks, and Long Shutter. Creative Filters adds special effects to your stills. Creative filters include Fish-eye Effect, Miniature Effect, Toy Camera Effect (Holga vignetting), Monochrome, Super Vivid, and Poster Effect. Discreet mode disables the flash, camera sounds and autofocus assist light. Spy mode, in short. HD Movie. 1280x720 at 30 fps. Click to download 19.5MB MOV file. Movie mode captures clips up to 4GB or 10 minutes in length in both HD and Standard definition. HD clips are 1,280 x 720 at 30 fps while SD clips are 640 x 480 or 320 x 240, both at 30 fps. You can also shoot with the Miniature Effect filter, at 5x (6 fps), 10x (3 fps) and 20x (1.5 fps) playback speeds. Sound is recorded monaurally and digital zoom is available (except with Miniature Effect). Use the Menu button to make changes to general camera behavior for Recording, Setup, Playback and Printing. Use the Function/Set button to make changes to exposure settings. In addition, the four-way navigator arrow buttons provide a few handy shortcuts as explained in the Controls section above. Storage & Battery. The Canon A3300 includes no built-in memory for image storage, relying entirely on the SD card in the memory card compartment. The A3300 supports SD/SDHC/SDXC, MultiMediaCard, MMCplus Card, and HC MMCplus cards. Choose at least a Class 4 card for HD video capture. A 4GB card will hold about 935 Large Fine JPEGs and 22 min. 5 sec. of 1,280 x 720 30 fps video. 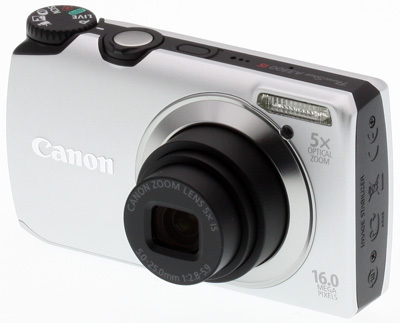 The Canon A3300 is powered by a compact, 3.6 volt, 740 mAh lithium-ion battery. Canon estimates about 230 shots or five hours using CIPA testing standards. I had no issues with battery life. The included charger has folded plugs so you don't need a cable or cord, perfect for travel. A $70 AC adapter kit (ACK-DC60) is also available. Image Quality. It's gotten to the point that when I see a 14-megapixel camera, I think I'm not going to have any fun reviewing the thing. In low natural light I'm either going to get unacceptable levels of noise or Impressionist-like noise reduction that wipes out any detail. So when I saw the A3300 with its 16-megapixel sensor, I thought of taking my first vacation in 12 years. To some place without electricity. But surprise! I really liked the images the A3300 brought home. They had a level of detail I could just rub my nose in. Or, less dramatically, just pixel peep. It's not perfect, because the Canon A3300 does struggle to balance noise suppression against detail, but it does a better job than most of its higher-priced competition. But as a CCD sensor, it's not a surprise to see it doing better than most CMOS designs. The comparison above is a little unfair because the Panasonic ZS10 is shot in partial sun while the A3300 is shot in full sunlight, increasing the overall contrast. But you can still get the idea of the difference between the two when you see the ZS10's more brushstroke-like rendering of the grass in the distance--low contrast detail--compared to the Canon A3300's rendering, which looks more like a photograph than a painting. Remember that the Canon A3300 costs $220 less than the Panasonic ZS10 and has two-million more--and therefore smaller--pixels, so it's clear that the A3300's CCD is better able to control detail despite its higher resolution. Shooting. OK, it isn't really small enough to be a keychain, but the Canon A3300 is compact enough to fit somewhere anytime you leave the house. And because it packs such wonderful image quality along, you won't want to leave it behind. I shot with the Canon A3300 in a variety of situations: indoors, outdoors, sun, shade, into the sun, sunset store windows at night, black and white, flowers in macro. It handled everything with ease. Zoom Range. 28mm to 140mm to 4x digital zoom. As usual, I stuck with Program but I tried Live and used Smart Auto quite a bit (once I realized it would slip into Macro mode for me). But what I didn't do, for the most part, was any EV adjustment or ISO fiddling. I left that to the Canon A3300 and it handled it very well. There is a series of gallery shots taken at -0.3 EV but that's a modest change in what were unusual circumstances. It saved me darkening them a bit in image editing software, however. And the one Low Light shot in the gallery may not be a great shot but color was accurate (not washed out) and detail sufficient if not sharp. I wouldn't hesitate to shift into Low Light. The image stabilizer, though, means you don't have to resort to that unless there's practically no light. There are two handheld 1/30 second shots in the Gallery, one at night of a store window and one of an interior, that are sharp at low ISOs. That shutter speed may not seem impressive, but with such a light, small camera, I'd expect problems (from my own shooting) under 1/60 second. Under ideal lighting, you really can enjoy the detail this 16-megapixel sensor captures. Two examples in the gallery stand out. The first is the row of logs, particularly in comparison to the Panasonic ZS10 capture. And the second is the macro shot of a seed pod. Canon claims the A-Series is now the Fun and Easy camera line-up. And it was both of those for me. But the A-Series used to be the one to pick if you had ambitions to be a photographer and needed an inexpensive student model. Canon stuffed the previous year's technology into a nice affordable bundle and gave you complete control over it. The Canon A3300 isn't that A-Series. This is the A-Series that will make you forget your cellphone. It takes much better pictures just as easily (and without buying camera apps). So what's the "one thing" I warned about in the introduction? It's still easier to share your images and video with a cellphone than with a digicam like the Canon A3300. There's no Share button on the A3300 as there is with some Kodak cameras. But there's a better solution to that problem than a Kodak. It's a WiFi Eye-Fi SD card, which instantly turns the Canon A3300 into an image and video sharing monster, assuming you can tap into a WiFi router. Attractive, simple, and inexpensive, the Canon A3300 has a good quality 16-megapixel sensor, a 5x lens, and turns out good quality images, and we had a good time with it. Be sure to look over the lens and image quality data below and our Pro/Con and Conclusion below! Sharpness: The wide-angle end of the Canon PowerShot A3300 IS' zoom shows a moderate amount of blurring in the top corners of the frame (strongest at top left) compared to what we see at center, though blurring doesn't extend far into the image area. At telephoto, the difference in sharpness between center and the corners isn't as strong, though the mild blurring that is present extends fairly far into the main image area. Geometric Distortion: There is actually only a little barrel distortion at wide-angle (0.3%), and almost no perceptible distortion (0.1% barrel) at telephoto. 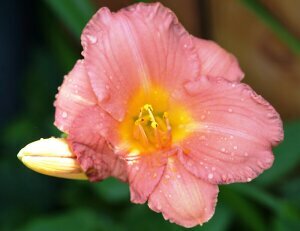 The PowerShot A3300 IS' processor is definitely at work here to eliminate geometric distortion. Chromatic Aberration: Chromatic aberration at wide-angle is moderate in terms of pixel count, though pixels are fairly bright. Telephoto, however, shows the opposite, with more visible pixels but less bright coloration. Macro: The Canon PowerShot A3300's Macro mode captures a fairly sharp image with strong detail, though blurring is strong around the corners and edges of the frame (a common limitation among consumer digital cameras in macro mode). Minimum coverage area is 1.69 x 1.27 inches (43 x 32mm), which is good. The camera's flash produced an uneven exposure, with a strong hot spot in the upper left and a dark shadow at lower right from the lens. So stick to external lighting for your closest macro shots. Viewfinder Accuracy: The Canon PowerShot A3300's LCD monitor showed about 100% coverage accuracy at wide-angle and at telephoto, which is excellent. Color: The Canon PowerShot A3300 IS produced very good color, with only a small amount of oversaturation in bright reds, some greens, and some bright blues. Yellows are undersaturated just a tad, but overall saturation looks natural and pleasing. 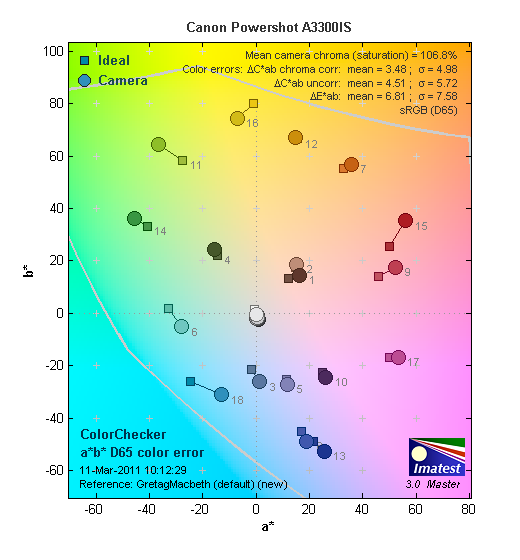 In terms of hue accuracy, the A3300 IS also performs better than average, though cyans are pushed toward blue, and bright yellows are nudged toward green. Both dark and light skintones are fairly accurate. Overall, very good performance. Incandescent: Manual white balance handled our incandescent lighting best overall, though the Auto setting also produced better results than average (though just the littlest bit red). The Incandescent setting came out quite pink. Resolution: Our laboratory resolution chart revealed sharp, distinct line patterns down to about 2,000, arguably 2,100, lines per picture height horizontally, and to about 2,000 lines vertically. 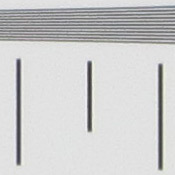 Extinction of the pattern occurred at around 2,800 lines per picture height. Flash: Our manufacturer-specified testing (shown at right) shows fairly bright results at the rated distance of 13 feet, though the A3300 IS raised ISO to 400 to achieve this. The telephoto test came out pretty good at 6.5 feet, though ISO was again increased to 400. Auto flash produced bright results in our indoor portrait scene, retaining some of the ambient light by using a slower shutter speed of 1/15 second, and raising ISO to 250. The Canon PowerShot A3300 IS' image stabilization should help with the slower shutter speed, but any movement of the subject could be problematic at this shutter speed. Shot taken at ~5 feet (~1.5m) on a stable tripod. ISO: Noise and Detail: Detail is already soft at ISO 80, due to some visible luminance and chroma noise pixels. Softness increases from there, with noise pixels becoming more pronounced. By ISO 1,600 fine detail is all but gone. See Printed Results below for more on how this affects printed images. ISO 80 and 100 shots print well at 13x19 inches, but they're too soft for 16x24 and 20x30. At 13x19, low-contrast areas are still somewhat soft, especially among reds, thanks to noise suppression, but it's pretty good for a $180 digital camera. ISO 200 shots are too soft for 13x19, but look better at 11x14. ISO 400 images are again far too soft for 11x14, but are good at 8x10, except for those low-contrast red areas, which are quite blurry. ISO 800 images are actually usable at 8x10 but sharpen up at 5x7. ISO 1,600 shots are also pretty good at 5x7, but most will be happier with 4x6. Overall it's a good performance for a low-cost pocket camera, but don't be too impressed by the 16-megapixel number, because thanks to the necessary anti-noise processing, it's only about as good as a 12-megapixel camera. Startup Time: The Canon A3300 takes 2.2 seconds to power on and take a shot. That's on the fast side of average for its class. Shutter Lag: Full autofocus shutter lag is average, at 0.55 second at wide-angle and 0.59 second at full telephoto. Prefocused shutter lag is 0.081 second, not the fastest out there, but still pretty quick. Cycle Time: Cycle time is sluggish, capturing a frame every 2.92 seconds in single-shot mode. Canon rates the A3300's full-resolution continuous mode at 0.8 frames per second, also slow. Flash Recycle: The Canon PowerShot A3300 IS' flash recycles in about 7.6 seconds after a full-power discharge, on the slow side. Low Light AF: The camera's AF system was able to focus down to just above the 1/8 foot-candle light level without AF assist enabled, though the camera was able to focus in complete darkness with the AF assist lamp enabled. USB Transfer Speed: Connected to a computer or printer with USB 2.0, the Canon PowerShot A3300's download speeds are moderately fast. We measured 6,102 KBytes/sec. 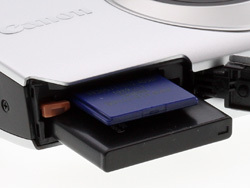 Large capacity, high-speed SDHC/SDXC memory card. 4 to 8GB is a good tradeoff between cost and capacity. The Canon PowerShot A3300 is one of those cameras your expert buddy (um, like me) would lead you right past at the camera counter of the BigBuy Store. It's not that it's unattractive (it's nicely sculpted, actually), but it's simple. 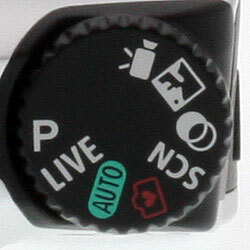 Just a lens with a Shutter button, a Mode dial, controls and an LCD. In fact, all the interesting things about the Canon A3300 are inside. A decent zoom range for the good 16-megapixel images, optical stabilization, 720p HD video, an intelligent Auto mode, a Live view of exposure adjustments, and fun creative filters. I wish the controls were not as stiff but I got used to them. What I didn't get used to was the gorgeous images. The little Canon A3300 captures good quality images with better detail than most digital cameras of this resolution deliver, with accurate color. Print quality was good at 13x19 inches from ISO 80 and 100 images, which is considerably larger than most Canon A3300 buyers will ever print, so I think we're safe saying that though 16-megapixels doesn't mean as much as it would seem, it's still enough to produce pretty big prints, and good quality 4x6-inch prints from every ISO offered. We have no qualms giving the Canon A3300 a Dave's Pick.